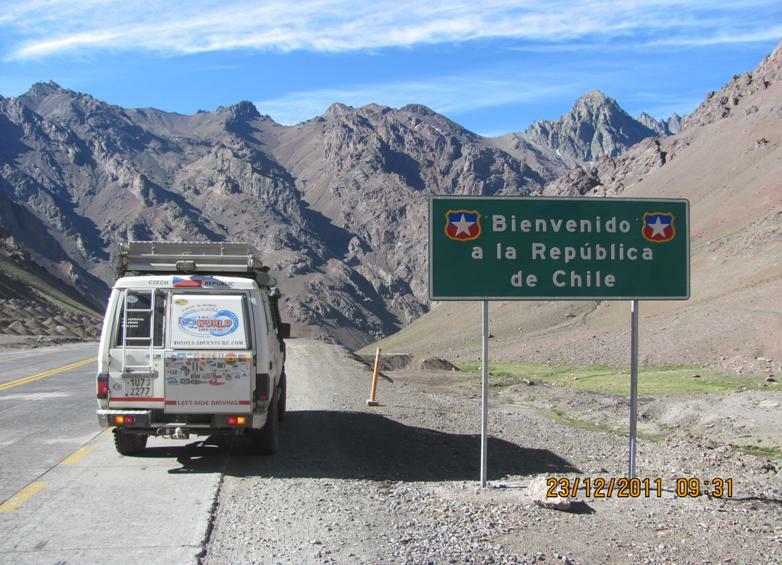 The border into Chile in the direction of the Argentine city of Mendoza is located in the high Andean pass near the highest mountain JA Aconcagua. The borders go down a long hill to the lowlands, where the capital of Chile is Santiago de Chile. We do not need to drive off into the city and therefore objíždíme and head to the Pacific coast, where we are going to spend Christmas 2011.Konečně we get to the Pacific. We stop at the beach, overlooking the setting sun disappears behind the horizon in places where thousands of miles from us lies Australia. We agree with the guys that we barbecue and Christmas sipping Chilean wine. So the next day we drive into town Valparasio, where a longer time to park and scattered around the shops. We buy, scan the old town and harbor where sailboats anchored wonderful school. We return to the car and find that we have half broken off the lock. Fortunately, the thief got into the car, only damaged the door. I’m a bit spoiled the mood. Continuing along the coast and some nice looking little place where we will spend the holidays. 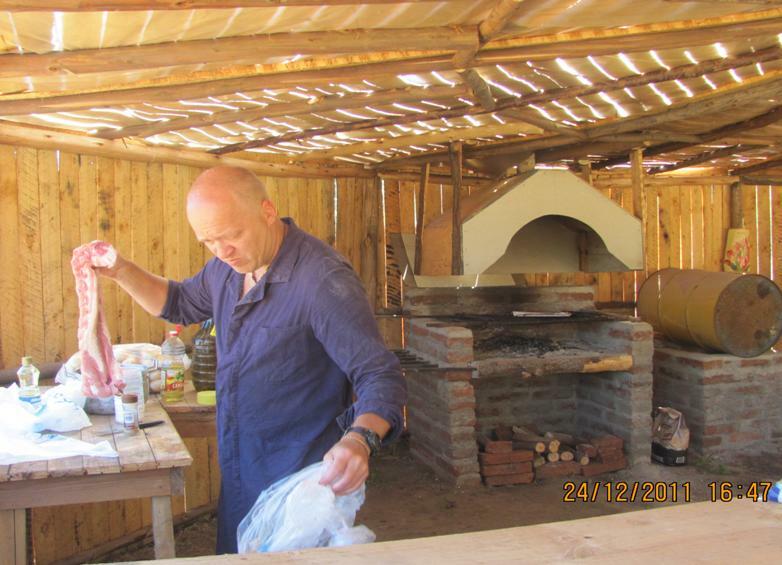 A few kilometers outside the city we find a small camp where he lives Chilean family. We have a barbecue, seating and the place where we sleep. Tools and pulled a bit trying to fix a door while we’re in the right management I change brake pads, it’s needed. Christmas party was a success, barbecue and wine was great too. Two days we spent in this place and then we headed back to Santiago de Chile. You planted the boys from Poland say goodbye and we agree with them a visit in Poland on the way back to the CR. Which will be in 2013 on the way from Siberia. We’re heading to the airport where he was my friend Mary arrive with a friend who travel to South America. We agreed that part of the trip will go with us. Handle is pointing and Copiapo, which lies north of Santiago de Chile. There I plan to wait and watch the world’s largest transit Dakar Rally. I am equipped with a big Czech flag and I intend to support our boys somewhere deep in the desert. At this point, the Czech controlled TATRA Ales range in the first five cars. We arrive in Copiapo, where everything was going to arrive ralye DAKAR. We are here but a few days earlier. 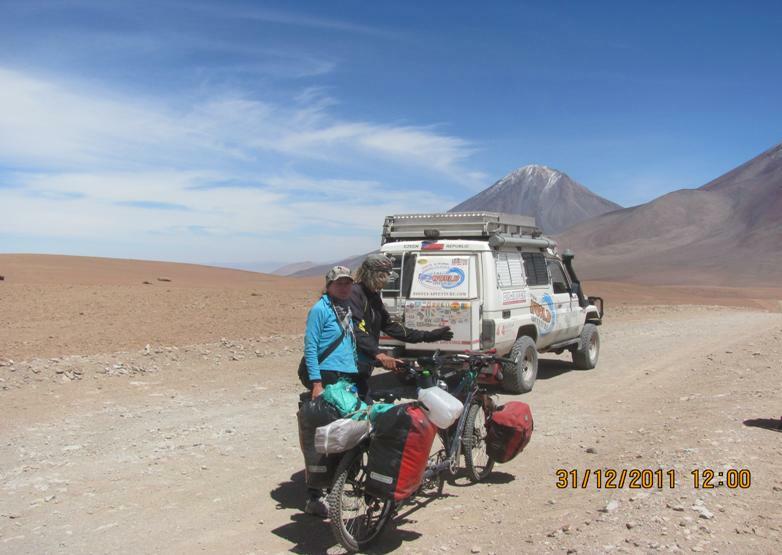 During lunch, we agree that we will take my known to Bolivia and return to Chile Dakar follow ourselves. So we are heading north to the direction of the desert town. Santiago de Atacama. Our journey leads boring desert of Atacama Santiago and we’re going to the mountains to the mountain crossing into Bolivia. The transition is 4600 m / nm, and we in this place on a dirt road we pass a pair of the wheelset. We do not understand and do not believe my eyes. 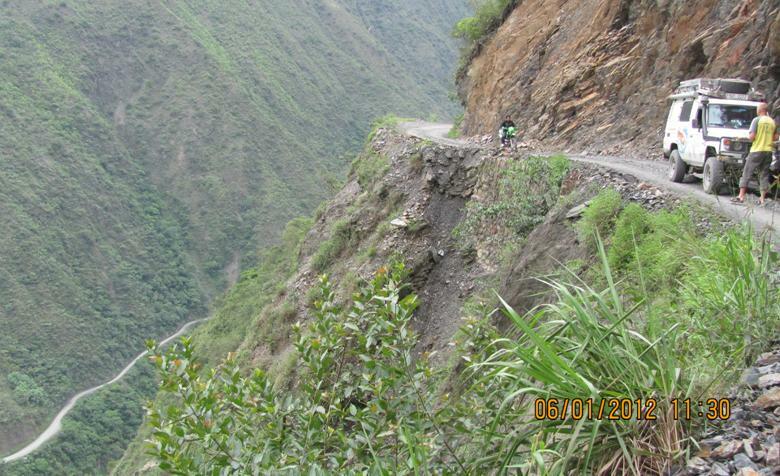 At these altitudes is difficult to walk, let alone pedaling a bike. We stop for cyclists and offer drinking water, far and wide because it is not possible to buy drinking water. We find that cyclists are back from Poland and several months in South America cruise. Say goodbye and continue our trip to Bolivia. In Bolivia, we cross the pass at an altitude 5040m/nm, a personal best of our Toyota, has never been so high. Also, it gives enough to know that she did not like it, smokes, twitches and has very little power. (Engine needs oxygen in these altitudes is little oxygen) It still do not realize that over the next few weeks we will move at altitudes around 4000m/nm. In the area of our trips are active volcanoes and volcanic activity is visible at every step, saline lagoons, red-colored earth, the place where the land rises from the hot mud and steam, sulfur vents, etc. rocky paths give the car a lot of hard time. Several hundred kilometers drive through this area towards the salt plain of Salar de Iuni name. Unfortunately, we find that the salt plain is flooded by rains. drive through the most dangerous road in the world from La Paz to the mountain village Croico and then on towards the border to Peru.